Sree Padmanabhaswamy Temple, located inside East Fort in the City of Thiruvananthapuram, is a temple dedicated to Lord Vishnu. The temple has an awe-inspiring structure that has a 100-feet high 'gopuram' or 'tower' built in a blend of the Kerala and Dravidian styles of architecture. A magnificent array of gods, goddesses, nymphs, sprites, and demons adorn the seven-storey 'gopuram' that forms the temple tower. The temple has a corridor with 365 one-quarter sculptured granite-stone pillars with elaborate carvings. Every pillar has the figure of a girl bearing a lamp in the palms of her hands joined together and raised above the waist. Also one can see many mural paintings in the temple corridor. 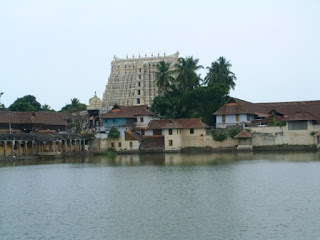 The temple stands by the side of a tank (seen in the snap), named Padma Theertham (meaning the lotus spring). Sree Padmanabhaswamy Temple is the main architectural landmark of Thiruvananthapuram. The city derives its name from the presiding deity, Lord Padmanabha, who reclines on the "Anantha" (which is the name of the serpent he reclines on) in a conscious slumber. This Mahakshetra (greatest of temples) is one of the 108 divya kshetrams in the country. Outside the temple courtyard, there is a medley of shops that sell souvenirs, handicrafts, woodcarvings, and handiwork of sandal.